Behind the Names – Our Medical Oncology Team at Regional Veterinary Referral Center. 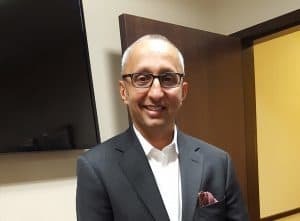 Dr. Khanna is a graduate of the Western College of Veterinary Medicine in Saskatoon, Saskatchewan, with continued training through a small animal medicine and surgery internship at the Ontario Veterinary College and an internal medicine and oncology residency at the University of Minnesota. He continued his cancer research by completing a PhD in pathobiology at the University of Minnesota, where he studied immunotherapy of metastatic cancers. This was followed by a Senior Postdoctoral Fellowship with the National Cancer Institute, National Institutes of Health in Bethesda, Maryland. He has practiced veterinary oncology in the greater Washington, DC area for nearly 15 years through his practice, The Oncology Service. As a bridge between his work as a clinician and clinician-scientist, he founded Animal Clinical Investigation, which is a nation-wide network of partners that provides access to novel treatment options for dogs and cats afflicted with complex medical problems. Dr. Khanna serves on the editorial board of the Journal of Veterinary and Comparative Oncology and the Journal of Veterinary Internal Medicine. He has authored over 100 text book chapters and manuscripts in the field of oncology. He is the Chair of the Osteosarcoma Biology Subcommittee of the Children’s Oncology Group and current President of the American College of Veterinary Internal Medicine (Oncology). In addition, he is a founding member of Canine Comparative Oncology and Genomics Consortium. Dr. Khanna lives in the greater Washington, DC area with his wife, two children, and their dog named Odin. He is also active in the community as a soccer and ice-hockey coach and continue avidly struggling with the game of golf. Dr. Stewart is a graduate of the University of Pennsylvania School of Veterinary Medicine. After completing her VMD, she completed a small animal medical internship with the Veterinary Referral Associates in Maryland. 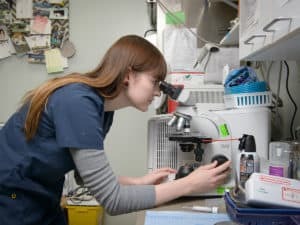 During Dr. Stewart’s internship, she completed a study on emergency radiation therapy for dogs with urinary obstruction due to bladder and prostatic tumors. Through this study she discovered her passion for oncology. After working jointly in emergency and oncology in Maryland, Dr. Stewart eventually moved to oncology exclusively. She joined TOS in 2011 initially in our Richmond location. She has had the unique experience of working in all 4 TOS locations but now work primarily in our Springfield clinic. 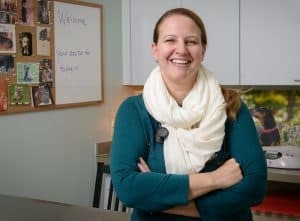 Dr. Stewart has a special interest in the human-animal bond and as a result, her focus lies in maintaining a high quality of life for her patients. She is married and has 3 kids, a beautiful Golden Retriever named Emerald, and a few chickens to keep her busy when she’s not at work! A cancer diagnosis in your pet is a frightening experience that can be associated with stress, concern, and anxiety. The Oncology Service at The Regional Veterinary Referral Center is here to help. For over 15 years, The Oncology Service has provided individualized cancer care, one patient at a time. We truly enjoy getting to know all of our patients and their families, and are committed to help you navigate the decision-making process so as to provide the optimal treatment approach for you and your pet. This process involves the integration of medical, surgical and radiation oncology treatments with palliative measures that collectively improve quality of life. At The Regional Veterinary Referral Center, our team in Medical Oncology is led by Drs. Chand Khanna and Bridget Stewart. Drs. Khanna and Stewart work closely with Dr. Ira Gordon, our Radiation Oncologist, to provide fully integrated and comprehensive cancer care for your pet and our patient. A Perspective of Hope and Innovation in Cancer Care for Your Pet. The Oncology Service is uniquely qualified to assess all opportunities to improve outcomes and quality of life for your pet. As veterinarians who have been specifically trained in treating pets with cancer, it is our only focus. We are devoted to caring for your pet with cancer in every way possible. Based on our training, experience, and devotion to innovation we have access to more treatment options than anywhere else. These treatments include conventional chemotherapy, small molecule inhibitors, cancer vaccines, radiation therapy, surgery, and more. 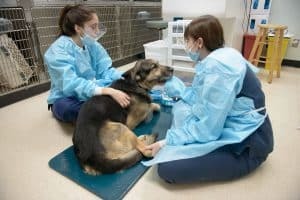 We are also able to deliver new treatment options through clinical trials supported by our unique relationship with Animal Clinical Investigation (www.animalci.com). The Use of Chemotherapy In Pets. The good news is that nearly all patients diagnosed with cancer have the potential to receive treatments that can improve outcomes and quality of life. Although we use the same drugs that are used in human oncology, the similarities in the chemotherapy experience stop there. In general, chemotherapy in dogs and cats is well tolerated. This is in part related to our goal to use protocols that maximize quality of life, our used of supportive medical treatments and the resilience of our pet animals. Most pets will experience some mild and self-limiting side effects including decreased appetite, energy, and attitude that should not last longer than 24-48 hours. The risk for more significant side effects includes a 1:10 chance of vomiting and a 1:100 chance of life threatening complications primarily associated with white blood cell suppression (neutropenia) and secondary infections. Our expectation is that the vast majority of dogs will have an excellent quality of life while on therapy. We are here to help serve you and your pet’s needs and look forward to helping you and your family. We encourage you to learn more about your pet’s treatment options by talking with one of our oncologists. Compassion, hope, and innovation is what we are known for, while we extend quality of life, one pet at a time. Please visit our website: www.TheOncologyService.com to learn more about our services, or give us a call to schedule a consultation. We look forward to helping you and your pet. What to Expect From Your First Meeting with our Medical Oncology Team. During your initial consultation, your pet will have a thorough history obtained about their disease and concurrent medical conditions. We will perform a full physical examination, review diagnostic tests that have been performed, and discuss the need for any additional diagnostic tests. After all the information is obtained, we will then integrate all pertinent findings and present an overview of the diagnosis, the treatment options available including the goals, the side effects, and the costs associated with that therapy, and will then help tailor a customized treatment plan to fit your pet’s and your family’s goals and needs. Treatment for your pet will then be followed up either with our medical or radiation oncology team at The Regional Veterinary Referral Center or coordinated with your primary care veterinarian. Many pets diagnosed with cancer have the potential of receiving treatments aimed at addressing the cancer condition and/or improving and maintaining their quality of life. The extent and duration of a treatment benefit is dependent on many factors including the type of the cancer, the stage of the cancer (i.e. the extent of disease), the available therapies used to treat the cancer, and the individual features of the patient. Many animals with cancer now can be cured or managed long-term and this goal should not be overlooked.